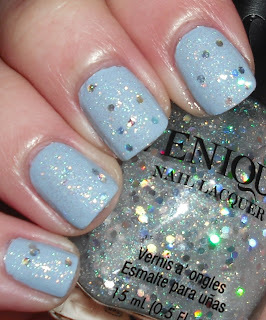 Twinkling Snow is a glitter top coat consisting of teeny tiny iridescent microglitters mixed in with large holographic hexagonal glitters. This is glitter is gorgeous, and completely unique. I do not own anything like this. This is an instant favorite for me! It really is a creative use of glitter with the vast difference in sizes, and the combination of holographic and iridescent. I did some research on this brand, and found more information on Nails Beautiqued and Polarbelle's blog. From what I gather this is a new brand, and they will be releasing 78 colors in January. The problem is that these are going to be sold at Cosmoprof and select salons. This means that they will be hard to find. I found them at a rather unknown small beauty supply store, so you may get lucky and find them in a salon or a something similar. Sadly, I do not think we'll be seeing these at our typical go-to polish stores like Ulta or Sallys :(. OMG soo pretty!!! I've seen these on some other blogs and not in person. I loove these types of glitters. this is so pretty! i think i have something similar.. but either way ! why do you tease us with HTF polish!! booo ;D jkn ! i like how it looks over blue more than black ! did you get any more of this brand? Yay yay yay!!! Glittery shimmery things. Love the Venique Twinkling Snow. Interesting!! I'll have to keep an eye out for the brand... Looks beautiful! I love how it looks like instant nebula nails over black and then like delicate snowfall over Kristen. 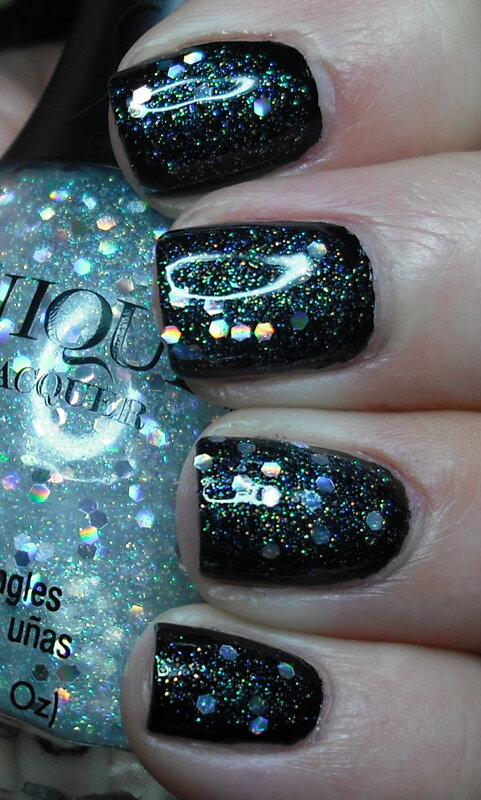 :swoons: It IS an amazing polish. Hopefully your little beauty supply store will keep stocking them when they launch those new 78 colors!!! Gorgeous! I'm not familiar with this brand but it sounds cool! 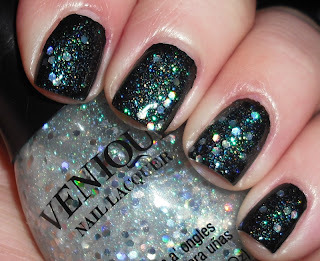 These kinda glitters are so stunning on black! 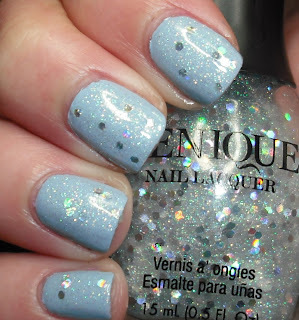 I love it over Zoya Kristen! Me too :(. I hope that changes at some point. Thanks! I know...I really hope that will change. They are a newer brand, so maybe once they have a more of a following they can open up to bigger markets? Thanks! That's cool! I need to get my hands on some more foreign brands. They always have better polishes! I agree! They always stand out the best against black. Thanks! I wasn't either, but they have me interested! I just wish you could find them in more stores. I'm so glad we got this! I think it was big score! Haha, it is true. I love how I was telling you at lunch how I've become super picky with polish. You would of never known based on my shopping habits. :P I can't wait to do it again. It was so much fun hanging out with you! I know, I'm sorry..but it was too pretty not to show you guys. I didn't get anymore from this brand, but I may have to go back and get more! Vote for the Best of 2011!